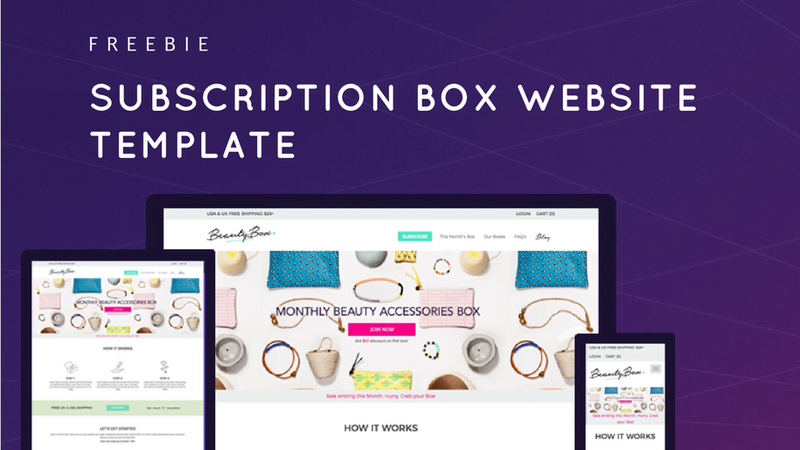 An impeccable free website template for all the subscription box websites out here! A beautiful, responsive free website template for starting a subscription box business! Imagine the happiness of your customers when they receive a gift package at their door after a long, exhausting day at work. It certainly feels great, doesn’t it? Times have changed and so have the mindset of people. Instead of waiting for others to do the honors, people love to indulge in self-love and get instant gratification. This is a major reason of the subscription box website industry growing at an unprecedented rate. “The last three years have seen an instant upsurge in subscription box website visits with a whooping 3000 percent overall growth”. Hence, if you want to extract the benefit of your subscription box website to its fullest and emerge as a leader in the industry by bringing more and more customers onboard, you must analyze the popular trends and implement the one that’s not only unique but, creative too. Wondering how would you do that? We at MySubscriptionBusiness have got it covered for you. Apart from helping you setup a convenient and easy to manage subscription box website with a seamless customer experience, we strive to give you an edge over the competition with our creative and out-of-the-box ideas. And, our newest and quirkiest idea on the board is a free subscription website template – Yes. You heard that right. It’s absolutely free. We are giving freebies in the form of free subscription website theme. Could it get any better? A subscription box website theme is imperative for enticing your customers, thereby increasing your subscribers. “According to a study done by Shorr Packaging, a typical subscriber has around 12 subscription boxes in his/her wish list”. And, with a free subscription box website design, attracting your customers becomes cost-effective too. Isn’t it a win-win situation? Still on the fence if it’s worth it or not? Well, look at our free subscription box website template’s features and decide it for yourself. Easily customizable: It can be easily customized as per your unique business needs. Whether you wish to integrate it with WordPress, Shopify or Magento, it is scalable and flexible to work across all major e-commerce CMS’s, and you can personalize it exactly the way you want. Highly responsive: This template is completely responsive and is compatible with all the devices ranging from smartphones, tablets and laptops. Seamless adaptation: This HTML template is designed for a monthly beauty box but, can be easily converted and customized for any kind of subscription model based website. Be it a monthly subscription box website or an yearly one for books, clothes, pets, snacks etc, it can be utilized the way you want. Want to take the plunge? Wish to get hold of this beautiful, contemporary free subscription business template and go a notch higher? Feel free to download it. And, in case you need any help with customization or are looking for starting a subscription website, reach us at [email protected]. We will get back to you at the earliest. Co-founder My Subscription Business. Subscription-business Consultant - Tech Enthusiast, Design Lover, Creative Thinker, Full-stack Developer.